With summer feeling like a dream long ago, we are left with cold nights and a great excuse to get this seasons vegetables cooked up into a hearty warm dish. What could be more perfect than a delicious tasty meal that’s really simple to make. I first discovered stuffed butternut squash last year (2012) when I received my monthly Zest magazine. I was so completely taken with it, that butternut squash has become a staple ingredient in my kitchen and is now often added to most new recipes I discover. 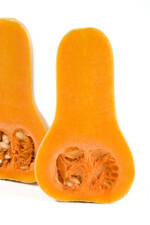 The original recipe ‘Aromatic Stuffed Butternut Squash’ can be found here on the Zest magazine website. My version has been spiced up and given a few added extras. My serving can feed up to 4 people when you quarter the squash (cut up after cooking) and serve extra filling on the side. Alternatively you can stick to 2 portions and save the extra filling for the next day. It’s probably easier to make this dish and work out the servings according to whether you want more squash or more filling and whether you’re adding a serving of vegetables/ salad. Cutting a squash can be difficult so please be careful. I usually place it on a damp tea towel and cut through the neck (thinnest part) slowly moving on to the ‘bulb’. I use a spoon to help scoop out the middle. You can use packet lentils and rice, Tilda do a great selection of rices that have a delicious flavour to them but you can use plain brown or white rice. Merchant Gourmet Puy lentils are great packet lentils, they are so much easier than preparing lentils from scratch. 2. If you are using raw rice/ lentils you will need to cook them according to packet instructions. (If you are using ready made lentils and rice you can use these straight from the packet but you won’t need them at this stage). 3. Chop the courgette, onion, garlic and chilli into small squares. 4. Heat a frying pan with a little oil. If using bacon, cook for 2-3 minutes before adding in the onion, garlic, chilli, courgette and tinned tomatoes. When the onions have softened, add lentils, rice and 1/2 pint of water. 5. Crumble a stock cube over the mix, add spices and cook for a further 2-3 minutes. 6. When the squash has cooked, remove it from the oven. Carefully fill the scooped out section with the filling. Any filling leftover can be kept warm and served with the stuffed squash or cooled and kept in the fridge for another day. 7. Place the stuffed squash in the oven for a further 25 minutes or until tender. 8. When cooked, serve with any left over filling, salad or on its own. This dish is very filling! You may feel it looks very little on its own but lentils, rice and squash are all filing ingredients.